Today We are going to discuss about amazon’s upgraded version Echo plus 2nd generation with built-in hub. Amazon has been already came out with new and different Echo units to meet the needs of its customers. 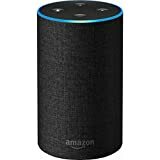 In late 2017, Amazon has been released the Echo Plus 1st generation, which made controlling your smart home easier.It’s powered by Amazon’s Alexa voice assistant, and has a built-in Zigabee smart home hub and so it can talk to smart home sensors.. And, On October 11, 2018, Amazon is going to release the Echo Plus 2nd generation. 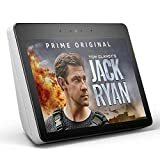 The upgraded version Echo Plus sports an added temperature sensor, localized voice controls and setup assistance that could make the Amazon Echo Plus an ideal smart home control center. To define the best things of the Plus 2 we need to compare it to the original. Both devices work great but the Plus 2 is the better option thanks to the temperature sensor and local voice control. The ability to gauge and adjust a room’s temperature makes this device a must as it truly improves your quality of life. The Amazon Echo Plus was designed to be the centerpiece of your smart home experience. It is shorter and wider than its previous version, at less than 6 inches tall and around 4 inches wider, given the fabric surface on its exterior. It still has the same blue ring, and it has four buttons on top: volume up, volume down, action button, and mic off button. The Plus 2nd gen comes in heather grey, charcoal, or sandstone. A 3.5mm AUX jack remains on the back for hooking up another speaker, too. Amazon claims the Echo Plus offers enhanced sound quality over its counterparts. A 3-inch neodymium woofer and increased back volume will give more depth and bass to its sound quality. 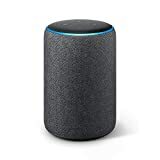 The new Echo Plus 2nd geration support Alexa’s new local voice control feature. That means If your internet or Wi-fi is not working, local voice control can do it so you can still use your voice to control your lights, plugs, and switches. That upgrade might not seem like a big deal, but it could be handy in an emergency and will make controlling your smart home much easier if you have spotty Wi-Fi. Echo Plus is a hands-free speaker you control with your voice, with a built-in Zigbee smart home hub. It connects to the Alexa Voice Service to play music from Amazon Music Unlimited (available in 30+ countries, separate subscription required) and TuneIn (Internet radio), ask questions, make calls or send messages to other compatible Echo devices or the Alexa App (requires iOS 9.0 or Android 5.0 or higher), and more. Just ask. You can also play music from your own collection or services on Echo Plus using Bluetooth from a compatible phone (without voice control). Use the Alexa App (from iOS or Android App stores, where available) to do even more with your Echo Plus. Hands-free calling or messaging with other Echo devices or the Alexa App. Also, quickly connect to other Echo devices in rooms throughout your home using just your voice (coming soon). If you use a standalone Echo (non-Plus), you’ll be able to use Alexa skills to perform some basic functions on your compatible smart devices. But, Echo Plus lets you do a lot more. You could set up your home theater to watch a movie in one step by having lights dim, the music turn off, and the TV turn on with one command, for instance. Both the first generation and second generation Echo Plus units have this capability, given the addition of the built-in Zigabee Hub. How to convert your basic Car into Smart Car? A much prettier speaker than the original Echo Plus, the 2nd gen smart home speaker also has improved audio components – even if its ZigBee internals are no longer unique. Better audio drivers Fabric design is attractive Temperature sensor. Still won’t catch the ear of audiophiles.